Seokguram Grotto in Gyeongju was established in the 8th century on the slopes of Mount Toham. The artificial cave contains a 3.5 m tall statue of the Buddha in the bhumisparsha mudra position, looking at the the East Sea (Sea of Japan). Seokguram Grotto and Bulguksa Temple is UNESCO World Heritage Site. Destination South Korea, officially the Republic of Korea (ROK), a country in eastern Asia that occupies the southern part of the Korean peninsula, which is located between the Sea of Japan (East Sea) in east, the Yellow Sea in west, and the Korea Strait, a sea passage between South Korea and Japan in the south. South Korea has a land border with North Korea in north. The country also shares maritime borders with China and Japan. With an area of 99,678 km² the country is about the size of Iceland, or slightly smaller than the U.S. state of Pennsylvania. South Korea has a population of 50.8 million inhabitants (in 2016), largest city and capital is Seoul, Busan is South Korea's second city and a major port. Official language is Korean. The Korean Peninsula extends southward from the northeastern part of the Asian continent. The country has a long history and proud tradition. Buddhism and Confucianism have influenced the nation's society and culture. Koreans, like many other Asian peoples, are descendants of the Mongolian Tungus stock. They differ from the neighboring Japanese and Chinese, however, in that Koreans are a homogeneous ethnic group with their own language, culture, and customs. Over the last several decades, South Korea has transformed herself from an agrarian society to an industrial leader on the world economic scene. Progress is being made in education, science and technology and social welfare. In 2002 South Korea has co-hosted, the FIFA World Cup™ tournament. After World War II, a republic was set up in the southern half of the Korean Peninsula (in August 15, 1945) while a communist-style government was installed in the north. The Korean War (1950-53) had US and other UN forces intervene to defend South Korea from North Korean attacks supported by the Chinese. An armistice was signed in 1953 splitting the peninsula along a demilitarized zone at about the 38th parallel. Thereafter, South Korea achieved rapid economic growth, with per capita income rising to 13 times the level of North Korea. In 1997, the nation suffered a severe financial crisis from which it continues to make a solid recovery. South Korea has also maintained its commitment to democratize its political processes. In June 2000, a historic first south-north summit took place between the south's then President KIM Dae-jung and the north's leader KIM Chong-il. In December 2000, President KIM Dae-jung won the Noble Peace Prize for his lifelong commitment to democracy and human rights in Asia. He was the first Korean to win a Nobel Prize. More information on South Korea's political system, foreign policy, economy, science and technology, and more. note: the South Koreans generally use the term "Han'guk" to refer to their country. The Municipality of Seoul (pop. 11 million). Type: Republic with powers shared between the president and the legislature. Liberation: 15 August 1945 from Japanese rule. Location: South Korea occupies the southern part of the Korean peninsula, the peninsula is surrounded by Yellow Sea, East China Sea, and East Sea (Sea of Japan). Highest mountains in S. Korea - Hallasan on Jeju Island, 1950 m.
Climate: Temperate, four distinct seasons, and heavier rainfall in the summer. Language: Korean, spoken by 70 million people and 5 million overseas Koreans. Writing system: Hangeul, the Korean alphabet, was invented by King Sejong the Great in 1443, consisting of 10 vowels and 14 consonants. Natural resources: Limited coal, tungsten, iron ore, limestone, kaolinite, and graphite. Agriculture products: Rice, root crops, barley, vegetables, fruit; cattle, pigs, chickens, milk, eggs; fish. Industries: Electronics, telecommunications, automobile production, chemicals, shipbuilding, steel. (Source: Korean National Statistical Office and others). South Korea key statistical data. Reception Center at Cheongwadae the "Blue House", the South Korean presidential residence in Seoul, South Korea. 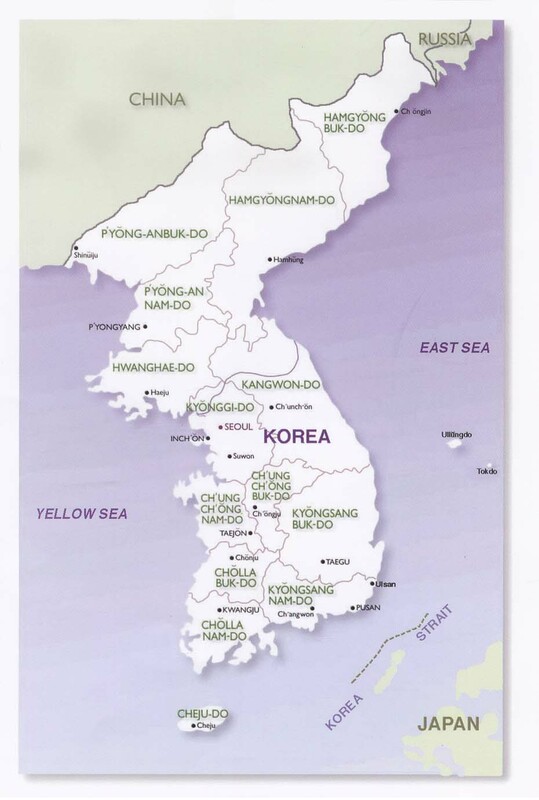 South Korea is a presidential representative democratic republic, specified by the constitution. Legislative power is vested in both the government and the National Assembly. Head of state is the President, the president is also the chairman of the cabinet, the chief executive of the government, and commander-in-chief of the armed forces. If the National Assembly votes against a presidential decision, it will be declared void immediately. Head of government is the Primeminister. Official website of the President's office. In Korean and English. Official English-language web site of the South Korean Government operated by the Korean Overseas Information Service (KOIS). Office for Government Policy Coordination Prime Minister's Secretariat. The site provides a general introduction of the National Assembly and basic materials on Korea's legislative activities. The Ministry of Foreign Affairs is in charge of diplomacy, external economic policy, overseas Korean nationals, international situation analysis and overseas promotional affairs. South Korea's representation to the United Nations. Directory of Korean Missions Abroad. List of foreign Consulates, Embassies and Organizations in Korea. Political Map of South Korea. provincial capitals, major cities, main roads, railroads and major airports. Government of The Republic of Korea. Ministry of Foreign Affairs and Trade 2001. Searchable map and satellite view of the Korean Peninsula. Searchable map and satellite view of South Korea's capital city. Searchable map and satellite view of South Korea's second largest city. 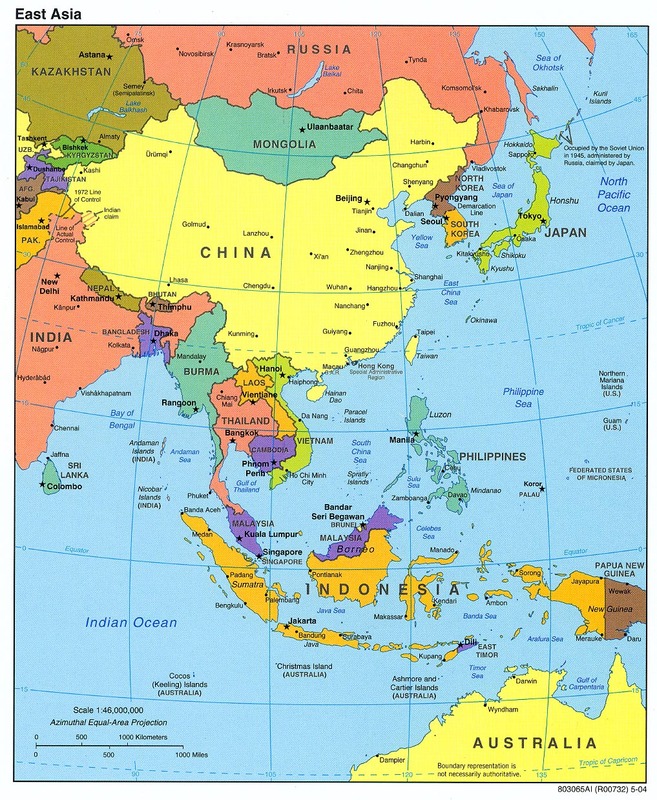 Political Map of East Asia. Daily News in English about Korea. National and international news (English edition). The Korea Times Online News. National and international news by Korean Broadcasting System. Public agency under the Ministry of Culture, Sports and Tourism. Established to show the public the desirable direction into which Korean art and its culture should go forward. 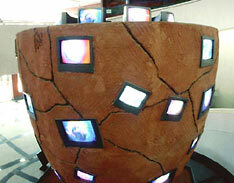 The main museum in Gwacheon (south of Seoul) has three branches, in Deoksugung, Seoul and Cheongju. Art museum in the old Korean Supreme Court building, operated by Seoul City Council. A sanctuary of 5.000 years of Korean art and culture. Platform for news on Korean pop culture K-Pop and celebrities. Deconstructing Korean Dramas & Kpop Culture. A must-see comical performance integrating uniquely Korean traditional drumbeats made with kitchen equipments. online TV with P2P video streaming service. Users can upload their own videos as well as live video streams. Official Site of the Korean Football Association. Hapkido is a traditional Korean self-defense martial art. Taekwondo a martial art which has been developed over about 20 centuries in Korea is today a modern, international sport. A center of Taekwondo history and world-class Taekwondo. The Central Bank of South Korea is based in Seoul, it is the sole issuer of the South Korean Won. The Korea Stock Exchange opened its market March 1956 with twelve listed companies, it is the sole securities exchange operator in South Korea. The largest bank in South Korea. The KCCI is the oldest and largest business organization in Korea. KOTRA is connecting worldwide buyers with Korean suppliers. 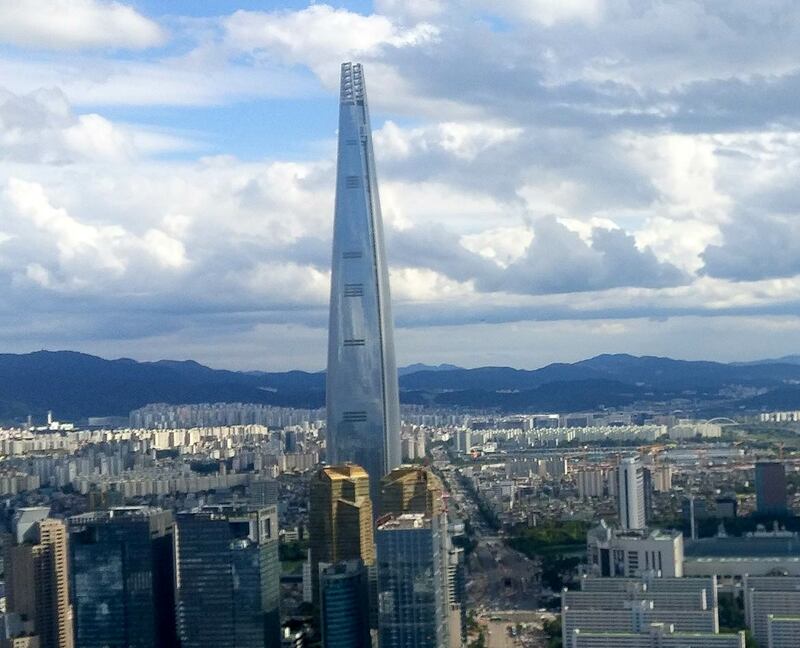 Lotte World Tower, the 123-floor, 554.5-m supertall skyscraper in Seoul is highest building on the Korean Peninsula. It opened to the public on April, 3rd 2017. Some critics say that the skyscraper is towering over the city like Korea's family-owned powerful conglomerates, known as chaebols, which dominate South Korea's economy and politics. The South Korean conglomerate (Chaebol) includes Hyundai Automotive Group, Hyundai Department Store Group, and Hyundai Heavy Industries Group. South Korea's second-largest car manufacturer. A Korean Global Business Group. The multinational company is by far the largest conglomerate (Chaebol) in South Korea, it is headquartered in Seoul. DaeWoo Korean was a manufacturer of cars and electronic, it was dismantled by the Korean government in 1999. Daewoo was the second largest conglomerate in Korea after the Hyundai Group. A multinational steel-making company headquartered in Pohang, a port city at the Sea of Japan (East Sea) in Gyeongsangbuk-do province..
South Korean manufacturer of tires for passenger cars and trucks, it is the 7th largest tire company in the world. South Korea's largest retailer and first discount store, with 160 stores across the country. The Korean retail company is headquartered in Seoul, established in 1979. Doosan is a corporate holding company with multiple business areas, from electro-materials to fashion, to information and communication. The company is headquartered in Jung-gu, Seoul. Korea's second largest carrier, headquartered in Seoul with hubs at Seoul-Incheon and Seoul-Gimpo Airports. Seoul-Incheon International Airport is the largest airport in South Korea, located 49 km (30.5 mi) on the island of Yeongjongdo. Gimpo Airport was formerly South Korea's most important international airport before being replaced by Incheon International Airport in 2001. Korea Railroad Corporation is the national railroad operator in South Korea headquartered in Daejeon. It operates intercity, freight trains, and Korea's high speed rail lines throughout the country. 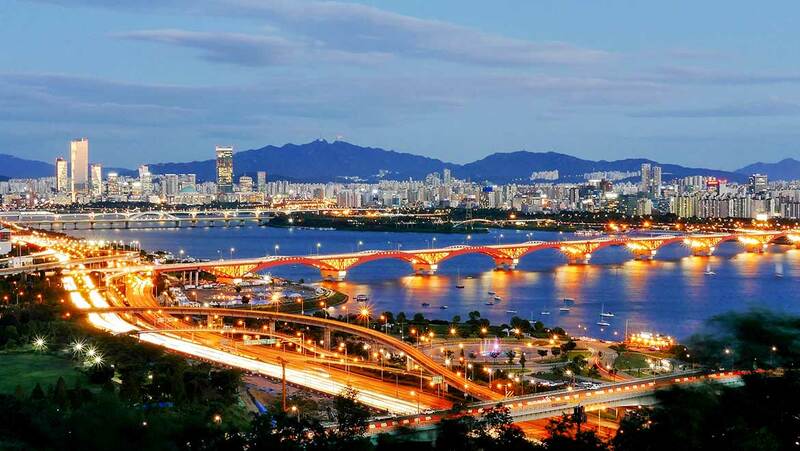 Seoul, South Korea's capital at the Han River, with Seongsan Bridge in center. 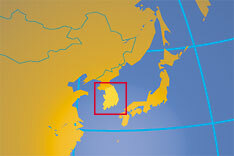 Chungcheongnam-do, Chungcheongbuk-do, Gyeongsangbuk-do, Jeollabuk-do, Gyeongsangnam-do, Jeollanam-do, and the island Jeju-do. 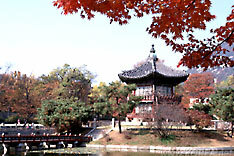 City destinations: Seoul, Busan, Jeju, Gyeongju, Gangneung, Chuncheon, Jeonju, Suwon, Andong. Official Korea Travel Site by Korea National Tourism Organization. Extensive information on all things Korean. Korean portal with guides to the country's culture. The Municipality of Seoul, the capital city of South Korea. The official cityguide by Seoul Metropolitan Government Tourism Division. Busan, the major port is the second largest city in South Korea after the capital Seoul, located at the southeast end of the Korean peninsula on the shores of the Sea of Japan (East Sea). 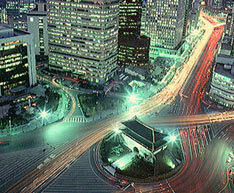 Daegu or Taegu, is Korea's fourth largest city, located in Gyeongsangbuk-do province. Daejeon or Taejon, South Korea's fifth-largest is located in the center of South Korea in Hoseo region. Gwangju or Kwangju, the sixth largest city in South Korea is located in the south west of the Korean peninsula in the center of the agricultural Jeolla region. Incheon Metropolitan City, located in northwestern South Korea is home to Incheon International Airport (IATA: ICN), the largest airport in South Korea. 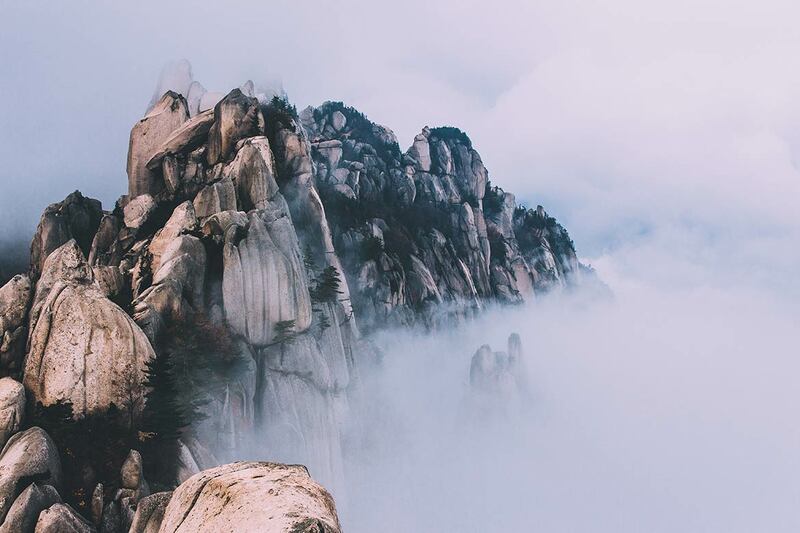 Seoraksan is the highest mountain in the Taebaek mountain range in Inje County, Gangwon Province, South Korea. 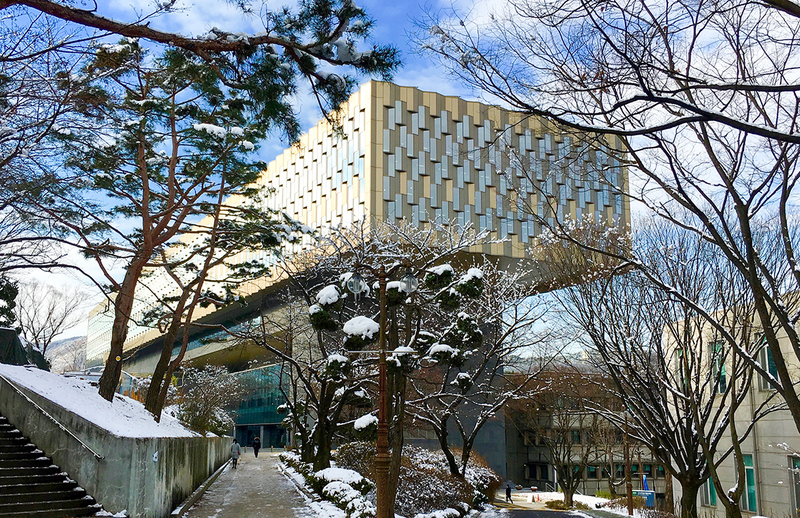 Library building of Seoul National University (SNU). Private university in the South Korean capital Seoul. The institution was founded in 1905, partly by imperial funds, as the first modern college of the country with the name Boseong College. The Korean Flagship Universities are designated as the provincial centers of higher learning. The Korean government created flagship National Universities for each province between 1946 and 1968. 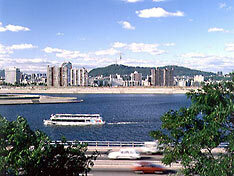 The university in Korea's second largest city Busan was established in 1946. Jeju University has several professional graduate colleges including a Department of Beauty and Cosmetology, the university is located in Jeju City, Jeju province, it was founded in 1952. Regional flagship educational institution in Chuncheon, Gangwon-do province. University in Daegu Metropolitan City, it has four campuses in Gyeongbuk province. A national research university in Jeonju, Jeollabuk-do province (North Jeolla). One of the five major national universities of South Korea, located in Gwangju, Jeonnam province. A major university in North Chungcheong Province, located in Cheongju, the province capital. A national university for liberal arts, agricultural sciences and engineering sciences in Daejeon in Hoseo region. A national university with degree courses in arts, social science, natural science, engineering, agriculture and life science, management, veterinary, education, nursing, and medicine. GNU is located in Jinju, South Gyeongsang Province. The Korean National Library is located in Seoul, founded in 1945. The library has over 10 million volumes, including over 1.2 million foreign-language books and some of the national treasures of South Korea. Hanok Village, traditional Korean Houses. Jirisan mountain in the southern region of the Korean Peninsula is the tallest mountain in mainland South Korea. Seoul based EcopeaceAsia is specializing in eco-peace making and nature conservation for a sustainable Asia. The Global Green Growth Institute (GGGI) is an international organization dedicated to supporting and promoting strong, inclusive and sustainable economic growth in developing countries and emerging economies, the organization is headquartered in Seoul. Non-profit organization in South Korea for the conservation of nature and life. 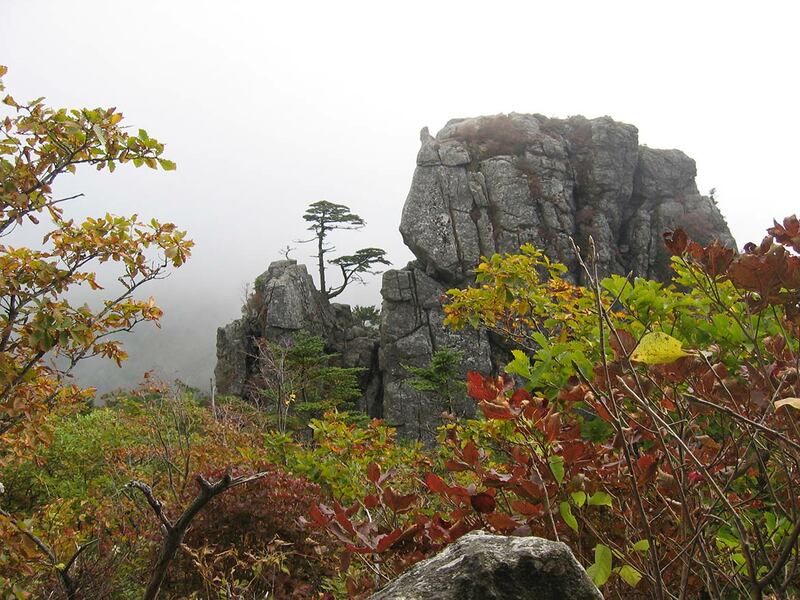 Official site of the Korea National Park Service with extensive information on South Korea's National Park System. NIKH's mission is to governmental the nation's historical heritage, founded in 1946. The national foundation myth - The short version. 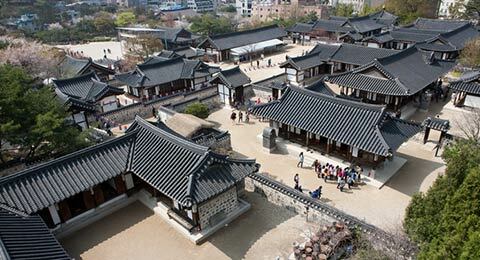 Dangun Wanggeom or Tangun was the legendary founder of Gojoseon, the first ever Korean kingdom. The long version. Wikipedia entry about Korea's History.